Properties in Medina average 4.5 out of 5 stars. Marrakech Magic, Riad Dar Hazzam, extraordinaire! 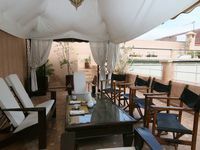 Property 31: Marrakech Magic, Riad Dar Hazzam, extraordinaire! Property 32: Luxury Apartment with air conditioning & just 1 minute walk to Hammam & Shops. The house and staff were very nice. We had a great time and would love to come back again!